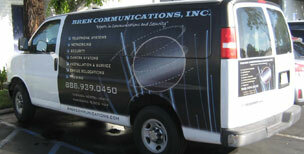 At BREK Communications, we have been dedicated to serving the telecommunication needs of Tustin since 1999. We provide Tustin businesses with expert communications and security system design, installation, configuration, training, repair and support services at cost-effective rates. In our 25 years, we have helped businesses in every industry become more time and cost efficient by expertly upgrading and integrating their communication systems. We specialize in providing cutting edge, highly efficient solutions at affordable prices. In fact, on average, our services cost 30% less than those provided by your local phone and cable companies. Additionally, our repairs are backed by a 100% satisfaction guarantee. Plus, we provide technical support 24 hours a day, 7 days a week, 365 days a years to ensure that your security and communication systems are always running smoothly and not interfering with your ability to do business. To learn more about why BREK Communications is Tustin's best value for phone, data, and alarm services, contact us today at (714) 939-0450. site surveys and estimates for all our communication and security system services are free. Every business should constantly be looking for new ways to increase productivity and efficiency, while lowering overhead costs. Brek Communications provides expert networking consultation services to help Tustin companies maximize their financial opportunities. With our expertise and experience, we can save your business money in the short and long term. Our reliable, efficient, and streamlined service ensures that your business runs smoothly without interruption, and that you pay less for your communication and security systems going forward. Call today for a free site survey and estimate. Call BREK Communications today to schedule a free site survey and estimate for telephone system service in Tustin. BREK Communications is Tustin's best value for high quality security systems and related services. Our cost-effective, professional security services include installation, integration, programming, training, repair, upgrades and 24-hour technical support. We will customize your security system service for your business's needs and budget. We offer the leading brands in security at affordable prices, such as Honeywell, Northern, Ademco and Bosch, and our security systems include a full range of state-of-the-art components and options. Call BREK Communications today to find out more, or to schedule your free site survey and estimate. Call BREK Communications today to schedule your free site survey and estimate in Tustin for computer and enterprise network services.